Intrinsic Factor is an enzyme like substance secreted by the stomach. It is present in the gastric juice as well as in the gastric mucous membranes. 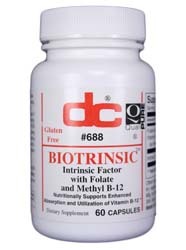 Without the proper amount of Intrinsic Factor, orally administered Vitamin B-12 is not optimally absorbed and utilized. Patients with an Intrinsic Factor deficiency can not receive maximum benefit from the oral administration of Vitamin B-12. Directions: As a dietary supplement, take 1 capsule two times daily, morning and evening, preferably with a meal.